The nose has cedar wood, plums, damsons and a faint hint of cinnamon. The mouthfeel is thin with little cling, quite fleeting really. The body has light, sweet feel - more of the plums and damsons, then sandalwood and cedar and then a hint of dandelion going into the finish. The finish itself is sweet, dandelion and damson - with hints of flat lemonade. Water brings out thick, expanding whorling that lingers for a while. The nose now gains more cedar wood and less of the fruit. The body gains icing sugar, and loses some of the wood notes. The finish gains a hint of cinnamon. 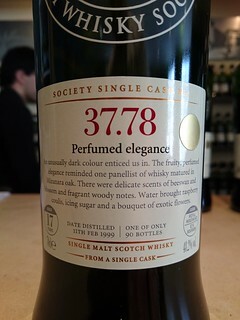 A lovely light dram - a summer's day breakfast!